KEYSTONE, Colorado (CNN) -- Skiers and snowboarders can cut the risk of brain injury dramatically by wearing helmets on the slopes, some experts say. 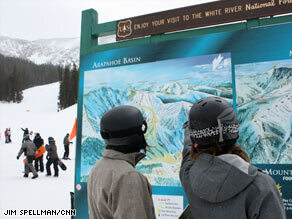 Two snowboarders at Colorado's Arapahoe Basin ski area wear helmets as they plan their runs. The death of actress Natasha Richardson this week, after a skiing accident that seemed minor at first, drew attention to the dangers of head injuries while skiing. "Wearing a helmet is a personal decision that I chose quite a while ago," says Patrick O'Sullivan, Ski Patrol director at Arapahoe Basin ski area in Colorado. "I've been doing this about 25 years and it took me half my career to decide that I wanted to wear a helmet, and I wear one pretty much every day." O'Sullivan began wearing a helmet when he was given a free one by Dr. A. Stewart Levy, chief of neurosurgery and neurotrauma at St. Anthony Central Hospital in Denver, Colorado. Levy began giving away helmets in 1997 to ski patrollers and instructors across the Rocky Mountains in an effort to raise awareness about helmet use. By last year, he had given away 1,000 helmets. He also gave hundreds more to rental shops so they could loan them to skiers and snowboarders who were renting equipment. Levy says he's done a study ­-- not published, but presented to conferences -- ­ that looked at cases from 1998 through 2005. He says helmets reduced the risk of brain injury by 75 percent. Other studies show a reduction in brain injuries of 50 percent to 80 percent, Levy says. TIME.com: Could a helmet have helped? But he says a helmet is just part of the recipe for a safe day on the slopes. "A helmet does not prevent all brain injuries and other types of injuries," Levy cautions. "So you still have to ski responsibly. A helmet is not a license to ski recklessly." O'Sullivan agrees. At Arapahoe Basin, they don't counsel skiers one way or the other on wearing helmets; they leave it up to individuals. But O'Sullivan encourages everyone to be aware of the conditions on the mountain and their own abilities on the slopes. He says accidents pick up in the afternoon -- a time ski patrollers call the "witching hour" -- when skiers begin to get tired and may take on challenges they can't handle. "You've got to know your abilities and take every day as a fresh day," he says. "Know where you are skiing, know what the conditions are -- things change very rapidly." Forty-three percent of U.S. skiers and boarders wear helmets, according to a 2008 survey by the National Ski Areas Association, the trade group that represents ski resorts as well as ski gear manufacturers. That's up from 25 percent in 2003. NSAA strongly recommends helmet usage. "We urge skiers and snowboarders to wear a helmet, but to ski or ride as if they're not wearing one" so they don't get careless, says Dave Byrd, director of education and risk for the group. Byrd backs up Levy and O'Sullivan's argument that what's going on inside the skier's head is as important as the equipment on the outside. "Our position is the skier's behavior has as much or more to do with the safety of the sport as does any piece of equipment." he says. "The most important thing is being a responsible skier or snowboarder." The association says that despite the increase in helmet use, deaths on the slopes have remained fairly constant. "What we've found is that helmet usage did not affect fatalities," Byrd says. He says helmets tend to be helpful in preventing lesser head injuries such as scalp lacerations or mild concussions. Recreational ski and snowboard helmets are manufactured to a standard that provides protection at 14 mph or less, whereas it is common to ski and snowboard between 25 and 40 mph, he says. "So when you're going at that speed and you hit a fixed object like a tree, whether you're wearing a helmet isn't going to matter," Byrd says. A NSAA fact sheet says in 2006, there were 2.07 skiing/snowboarding fatalities per million participants, fewer than for bicycling or swimming. The group says a person is twice as likely to die from being struck by lightning as in a skiing or snowboarding accident. About half of the skiers and snowboarders at Arapahoe Basin on Wednesday were wearing helmets. Snowboarder Dave Millman, visiting from Massachusetts, says he learned the value of a helmet the hard way. "I've been wearing one now for five or six years," he says. "I picked it up after skiing through the trees a lot and taking too many branches to the head -- so I thought it was a good idea to throw the cranium cap on." As the sun dips over the mountain during the "witching hour," a novice snowboarder wipes out near the ski lift, the back of his head whacking the hard-packed snow. He isn't wearing a helmet. His name is Mika Babcock and it is his first time snowboarding. He is a student at Purdue University in Indiana, visiting on spring break. He has already fallen and hit his head several times on Wednesday. Babcock is skeptical that a helmet, which generally doesn't cover the face, would help. "That fall you witnessed was actually the first time I cracked the back of my head. Usually it's the front," he says. "Do I regret not wearing one? No, not really. It's not too bad and I know what a concussion feels like, so I know I'm good so far." Babcock decides not to have the Ski Patrol give him the once-over. Instead he heads to the lodge for a quick rest before hitting the slopes again. "I'm probably going to sit down for a little bit and let my head clear up."